Hey all, I thought I'd take a slightly different angle with today's post and put up a few words about my recent dabblings with airbrushing. A few (well, 12, or thereabouts (wow, was it really that long ?!)) years ago, while I was at college, I was given my first airbrush as a birthday gift. I'd not long been into the hobby so hadn't really developed a solid painting style yet, but was convinced airbrushing was the way to start. After talking to the guy in the art store about my intended application, we picked up the recommended kit; a dual action airbrush and compressor. I experimented with it a bit, but was largely unsuccessful so quickly gave up on the idea. Much more recently I picked up a Citadel Spraygun and managed to source the necessary adaptors to connect it to my compressor, as I figured it would be more economical than buying tins of propellant. Again, after some unsuccessful experimentation and a dozen-or-so pots of citadel colour flowing down the drain, it all got put back in the cupboard, until I found it a new home with a colleague at work. Another year on and I'm increasingly frustrated at being limited to certain colour palettes that brush on easily where you have limited time and so after a lot of researching, I bought another Citadel Spraygun and a couple of tins of gas when the good people at Maelstrom Games had a promotional offer on. This time, the results were much better and I managed to undercoat, basecoat and camo my brother Olly's Dystopian Covenant fleet in very short order.I managed to coordinate my spraying schedule with promotional codes at Maelstrom and pick up a couple of tins of gas each time, to keep me going. 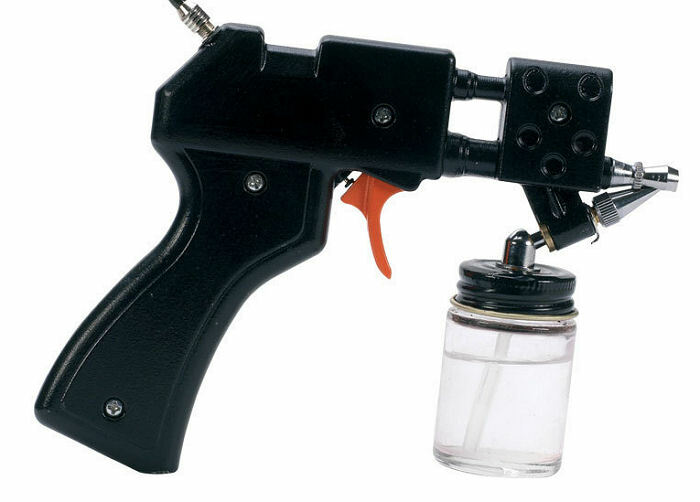 The spraygun is a very useful tool, but it is very much an entry level piece of kit and has it's limitations. One thing to bear in mind if you are going to use one is to have at least two usable cans of propellant handy each time you set out to use it. You'll need to switch back and forth as each gets cold and looses pressure, plus you'll need to use a fair amount when you clean down between colours and when you're finished. I was hooked after a short space of time and the opportunities now afforded were considerable. Red/yellow/pink figures were no longer out of bounds and the possibilities of an Emperor's Children warband were back on the radar. In this time I'd also been doing a lot of research online about the whole airbrushing thing and posted a few findings on here. In the end I picked up some new kit from the Airbrush Pro website and am really pleased with it. The airbrush is the BD-133 set shown on the site. It's a dual action (essentially meaning more control of the air speed and paint flow) airbrush and comes with a decent sized paint jar. My original Paasche airbrush from years ago was fairly pricey as I recall and only came with a tiny colour cup, which was fairly user-unfriendly. This one is really cracking and does exactly what I need, plus it retails for under £20, so I'm really stoked with it. The compressor is AS18(2) and again, I'm really impressed with it's performance. It's sold as low noise and it really is a stark contrast to my previous compressor which required ear defenders if you were using it indoors for any length of time. It's compact, relatively lightweight and is a great price. All in, the total bundle came to around £80 once you add in an airline and one or two other bits, so is an absolute steal, considering the rediculous price of stuff at the moment. Add in that you don't need to keep buying extra gas and you use paint more economically and it gets even better. Plus, (and this is really cliche), you're also buying time here too, as you can easily basecoat the average squad of figures in 10-15 minutes. If your painting figures like space marines that don't require much more detailing, the deal gets even better. All of that cheese aside, it's well worth considering if you're painting figures in any quantity. Have you tried using it in any other artistic out let yet? Just wondering how good it could possibly be for 2D painting? Not sure if you'd want to or not.